DUBAI, UNITED ARAB EMIRATES--(Marketwired - Apr 16, 2014) - The Ritz-Carlton, Dubai International Financial Centre is offering a new hotel package to guests, created to showcase the luxury Dubai hotel's burgeoning art collection, including over 20 new sculptures just arrived at the hotel, on loan from Opera Gallery, DIFC. 'Discover with You' invites guests to explore the artworks in a unique way, by enjoying a private tour of the Dubai hotel's own collection, as well as the DIFC gallery, guided by Opera Gallery's General Manager, Annamaria Bersani. A long term partner of the gallery, The Ritz-Carlton, DIFC has an impressive art collection of its own with over 100 paintings on display around the luxury hotel. This is complemented by a diverse range of around 30 sculptures, which Opera Gallery provides and changes on a quarterly basis. This month has seen the delivery of 20 new sculptures from internationally-renowned artists including Laurence Jenkell, Frederico Uribe and Mauro Corda. Highlights include 'Jack the Dog' by French artist Fabienne Arietti, a striking yet elegant bright purple Bull Terrier that welcomes guests to the lobby, and L'Espadon by Mauro Corda, a three meter long aluminum swordfish that sits in the stunning waterfall in The Sunken Garden (see below for further collection highlights). "As global travelers, we know that our guests are seeking unique experiences when they travel, and our extensive art collection provides an additional memorable experience for them to enjoy. Our partnership with Opera Gallery ensures we always have fresh pieces for our guests to explore, and by providing a guided tour with an expert in the field, we are able to enhance the overall experience even further." Annamaria Bersani, General Manager of Opera Gallery, DIFC adds, "I am delighted to be leading the guided tours for guests of The Ritz-Carlton, DIFC, as we are making art accessible for everyone, and are able to showcase our artwork in two completely different environments. Guests can enjoy the sculptures in the informal surroundings of the hotel, followed by the latest exhibitions in our DIFC gallery." Opera Gallery is just a five-minute walk from The Ritz-Carlton, DIFC and the guided tours can be tailored to the request of the guest, taking between 30 and 90 minutes. To reserve the 'Discover with You' package, call +971 4 372 2555 or visit http://www.ritzcarlton.com/dubaiifc. 48-hours' notice is required to book the guided tours. "Jack the Dog" was created in 2009, by French artists, Fabienne Arietti and Dominique Maraval who wanted to combine their talent: allegorical and politicized artworks for Maraval, and aesthetic and ancient painting techniques for Arietti. With "Jack" they wanted to create beauty from the bizarre, by trying to make this singular animal, the bull terrier, elegant and graceful. Uribe is a Colombian artist, now located in Miami. A conceptual artist, he experiments with pop art through the use of objects found in daily life, but with formal references to the history and tradition of classical art. "Cypresse" is a tree made from recycled books, symbolizing the circle of life for books, all of which came originally from a tree. 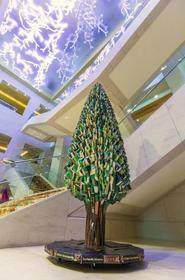 The tree also represents a second life for the books, as a piece of art. "Le Loup" meaning "the wolf" represents the animal, who according to Roman mythology, protected Romulus and Remus, the twin brothers who are said to have founded the City of Rome. The sculpture is made from bronze and glass, created by French artist, Mauro Corda. A three meter long swordfish made entirely from aluminium, portraying a floating swordfish in a metallic cage. French artist Corda was heavily influenced and inspired by the opti-cinetic movement of the 1950s. Further sculptures of fish from Corda are featured throughout the hotel, in areas including The Lobby Lounge and No.5 Terrace. A French artist, Jenkell's works are inspired by chocolate and sweets, which she describes as a woman's 'best friend' and depict objects of pleasure or sweet childlike memories, attracting the senses as bees are attracted to honey. The Ritz-Carlton, DIFC is currently displaying five of Jenkell's "Bonbon" sculptures, with "Bonbon Mimosa" the tallest, standing at two meters high. She developed a new process referred to as "Wrapping": the idea is to magnify an object by draping and twisting Lucite, perfectly capturing the shiny, transparent and rainbow-colored wrappings used by candy manufacturers. The Ritz-Carlton Hotel Company, L.L.C., of Chevy Chase, Md., currently operates 85 hotels in the Americas, Europe, Asia, the Middle East, Africa, and the Caribbean. More than 30 hotel and residential projects are under development around the globe. The Ritz-Carlton is the only service company to have twice earned the prestigious Malcolm Baldrige National Quality Award, an award that originated in 1987. Its purpose is to promote the awareness of quality excellence, recognize quality achievements of companies and publicize successful quality strategies. The Ritz-Carlton Hotel Company won the award in 1992 and 1999. For more information, or reservations, contact a travel professional, call toll free in the U.S. 1-800-241-3333, or visit the company web site at www.ritzcarlton.com. The Ritz-Carlton Hotel Company, L.L.C. is a wholly-owned subsidiary of Marriott International, Inc. (NASDAQ: MAR). Founded in 1994 by Gilles Dyan, member of the European Chamber of Expert-Advisors in Fine Art (C.E.C.O.A. ), Opera Gallery Group, now internationally established with 11 galleries in the world, is one of the rare international art gallery networks with locations on several continents: North America, Europe, Asia and Middle East. Since its creation, Opera Gallery Group has always strived to offer its international collectors unique access to a diversity of multicultural artists, from the works of Modern Masters such as Pablo Picasso, Marc Chagall, Bernard Buffet or Andy Warhol, just to name a few, to the most sought-after contemporary artists (Lita Cabellut, Gérard Rancinan, Joe Black, David Mach among others). The Ritz-Carlton, Dubai International Financial Centre is offering a new hotel package to guests, created to showcase the luxury Dubai hotel's burgeoning art collection, including over 20 new sculptures just arrived at the hotel, on loan from Opera Gallery, DIFC.